This chemistry dictionary offers the chemistry definitions starting with the letter H. These glossary terms are commonly used in chemistry and chemical engineering. Click the letter below to find the terms and definitions beginning with that letter. Haber process – The Haber process or Haber-Bosch process is an industrial process that is used to make ammonia from hydrogen and nitrogen. Fritz Haber received the 1918 Nobel Prize in Chemistry for the discovery of this process. hafnium – Hafnium is the name for the transition metal element with atomic number 72 and is represented by the symbol Hf. half-cell – A half-cell is half of an electrolytic or voltaic cell, where either oxidation or reduction occurs. The half-cell reaction at the anode is oxidation, while the half-cell reaction at the cathode is reduction. half-equation – A half-equation is an equation written to describe an oxidation or reduction half-reaction. Examples: Zn (s) → Zn2+ (aq) + 2e– is an example of an oxidation half-equation. half-life (t1/2) – Half-life is the time required to convert one-half of a reactant to product. The term is commonly applied to radioactive decay, where the reactant is the parent isotope and the product is a daughter isotope. Example: Tritium (H-3) has a half-life of 12.3 years where it decays into Helium-3 by beta decay. A 1 gram sample of tritium will only contain 0.5 grams of tritium in 12.3 years. In an additional 12.3 years, this same sample will only contain 0.25 grams of tritium. half-reaction – A half-reaction is either the reduction reaction or the oxidation reaction of a complete redox reaction. The half reactions each occur at an electrode of an electrochemical cell. halide – A halide is a binary compound where one of the elements is a halogen. Examples: Hydrochloric acid (HCl) is a halide because it contains only two atoms and one, chlorine, is a halogen. halide ion – A singlet halogen atom, which is an anion with a charge of -1. Examples: F–, Cl–, Br–, I– are all halide ions. haloalcohol – A haloalcohol is an organic compound containing adjacent carbon atoms where one carbon has a halogen substituent and the other carbon has a hydroxyl substituent. haloalkane – A haloalkane is an alkane containing one or more halogen atoms. haloarene – Haloarene is a molecule where a halogen atom is bonded to a carbon atom that is part of an aryl ring. Examples: Chlorobenzene, fluorobenzene, and bromobenzene are all haloarene molecules. halocarbon – A halocarbon is a hydrocarbon that contains one or more halogen atoms. Example: Chlorofluorocarbons (CFCs) are halogenated hydrocarbons. haloform – A haloform is a trihalomethane where all three halogen atoms are identical. Examples: Chloroform (CHCl3) is a haloform molecule where all three halogens are chlorine atoms. halogen – A halogen is an element located in Group VIIA (or group 17) of the periodic table. Halogens are reactive nonmetals having seven valence electrons. halogenated ether – A halogenated ether is an ether where one or more of the hydrogen atoms of the ether are replaced with a halogen atom. halogenated hydrocarbon – Halogenated hydrocarbon is another term for halocarbon. See definition above. halogenation – Halogenation is a chemical reaction where a halogen atom is integrated into a molecule. halogenoalkane – Halogenoalkane is another term for haloalkane. See definition above. halogenoarene – Halogenoarene is another term for aloarene. See definition above. halohydrin – Halodydrin is another term for haloalcohol. See definition above. halon – A halon is an organic compound containing one or two carbon atoms and halogen atoms. d is the number of bromine atoms. e is the number of iodine atoms. Halon numbers with less than five digits are assumed to have values of zero at the end of the number. Example: Halon 1011 is bromochloromethane (CH2BrCl): 1 carbon, 0 fluorine, 1 chlorine and 1 bromine atom. hapticity – Hapticity is a term describing how a group of contiguous atoms is bonded to a central atom of a coordination compound. Each atom of the contiguous group is bound once and only once to the central atom. The hapticity of a compound is the number of contiguous atoms bound to the central atom and is denoted by the Greek letter η. Example: Ferrocene is a molecule with two cyclopentadienyl rings bound to a central iron molecule. Since five contiguous carbon atoms are bound to the central iron atom, the hapticity is five. Ferrocene’s molecular formula is Fe(η5-(C5H5)2). hard water – Hard water is water containing high amounts of Ca2+ and/or Mg2+. hard x-rays – Hard X-rays are x-rays with energy greater than 5 keV. The symbol for hartree is either Eh or Ha. hassium – Hassium is the name for the transition metal element with atomic number 108 and is represented by the symbol Hs. HCFC – HCFC is an acronym for hydrochlorofluorocarbon, which is a compound composed of hydrogen, chlorine, fluorine and carbon atoms. HCFCs have been replacing traditional chlorofluorocarbons as refrigerants and aerosol propellants. They are typically considered less harmful to the environment than CFCs. heat – Heat is the form of energy that flows between two samples of matter due to their difference in temperature. Heat is usually denoted by the variable ‘Q’. Heat also applies to the process of raising the temperature of a substance. heat capacity – Heat capacity is the amount of heat energy required to raise the temperature of a body a specified amount. In SI units, heat capacity (symbol: C) is the amount of heat in joules required to raise the temperature 1 Kelvin. Examples: One gram of water has a heat capacity of 4.18 J. One gram of copper has a heat capacity of 0.39 J.
heat of formation ( ΔHf) – Heat of formation is the heat released or absorbed (enthalpy change) during the formation of a pure substance from its elements, at constant pressure and usually denoted by ΔHf. heat of fusion ( ΔHfus) – Heat of fusion is the change in enthalpy for the conversion of 1 mole or 1 gram of a solid to the liquid phase, at constant pressure and temperature and is usually denoted as ΔHfus. heat of sublimation ( ΔHsub) – Heat of sublimation is the change in enthalpy for the conversion of 1 mole or 1 gram of a solid directly to the gas phase, at constant pressure and temperature and is usually denoted by ΔHsub. heat of vaporization ( ΔHvap) – Heat of vaporization is the change in enthalpy for the conversion of 1 mole or 1 gram of a liquid to a vapor (gas phase), at constant pressure and temperature and is usually denoted as ΔHvap. heavy metal – A heavy metal is a toxic metal. There is no standard definition assigning metals as heavy metals. Some lighter metals and metalloids are toxic and thus are termed heavy metals, which some heavy metals, such as gold, typically are not toxic. Most heavy metals have a high atomic number, atomic weight and a specific gravity greater than 5.0. Heavy metals include some metalloids, transition metals, basic metals, lanthanides, and actinides. Examples: Heavy metals include lead, mercury, cadmium, sometimes chromium. Less commonly, metals including iron, copper, zinc, aluminum, beryllium, cobalt, manganese and arsenic may be considered heavy metals. heavy naphtha – Heavy naphtha is a type of naphtha distilled from 6- to 12-carbon hydrocarbons boiled between 90 °C and 200 °C. heavy water – Heavy water is water where the hydrogen atoms are comprised of the deuterium isotope atoms. Heavy water is D2O. hecto – Hecto is the prefix associated with 102. The symbol for hecto is h.
Heisenberg uncertainty principle – The scientific principle stating that it is impossible to determine with perfect accuracy both the position and momentum of a particle at any given point in time. helium – Helium is the name for the noble gas element with atomic number 2 and is represented by the symbol He. Helmholtz Free Energy – Helmholtz free energy is the amount of energy either absorbed or released in a closed system at constant volume and temperature. Helmholtz free energy is denoted by the letter A.
Henderson-Hasselbalch equation – The Henderson-Hasselbalch equation is an approximate equation that shows the relationship between the pH or pOH of a solution and the pKa or pKb and the ratio of the concentrations of the dissociated chemical species. Henry’s Law – Henry’s Law is a chemistry law which states that the mass of a gas which will dissolve into a solution is directly proportional to the partial pressure of that gas above the solution. hepatic air – Hepatic air is a deprecated term for the compound hydrogen sulfide, H2S. Hepatic air was the gas associated with the ‘rotten egg’ smell of burning sulfur. heptose – A heptose is a monosaccharide with seven carbon atoms. hepatotoxic – Hepatotoxic is when a chemical compound is harmful to the liver. Hepato is the Greek word for liver. Example: Tylenol or acetaminophen is hepatotoxic. hepatotoxin – Hepatotoxin is another term for hepatotoxic. See definition above. herbicide – Herbicides are a class of chemical compound that is toxic to plant life. Example: 2,4-dichlorophenoxyacetic acid or 2,4-D is a common herbicide developed to control broadleaf weeds around crops. hermetic seal – A hermetic seal is an enclosure of a volume making it impervious to air or a gas. Hess’s Law – Hess’s Law is a law which states that the energy change in an overall chemical reaction is equal to the sum of the energy changes in the individual reactions comprising it. heteroatom – A heteroatom is any atom other than carbon or hydrogen in an organic molecule. heterocyclic compound – A heterocyclic compound is a compound containing a ring structure composed of at least one non-carbon atom. Examples: Furan, pyrrole, and pyridazine are all heterocyclic compounds. heterodimer – A heterodimer is a dimer where both mer subunits are different from each other. heterogeneous – Heterogeneous refers to mixtures composed of non-uniform materials. Examples: A mixture of sand and water is heterogeneous. Concrete is heterogeneous. heterogeneous catalyst – A heterogeneous catalyst is a catalyst where the phase of the catalyst is different from the phase of the reactants. Example: The Haber process to create ammonia uses solid iron as a heterogeneous catalyst between the gaseous reactants of gaseous hydrogen and gaseous nitrogen. heterogeneous mixture – A heterogeneous mixture is a mixture having a non-uniform composition. Example: Concrete is a heterogeneous mixture of an aggregate, cement, and water. heterogeneous reaction – A heterogeneous reaction is a chemical reaction where the reactants are in different phases from each other. Example: The reaction between acid and metal (liquid and solid) is a heterogeneous reaction. heteronuclear – Heteronuclear refers to a molecule containing two or more different elements. Example: NaCl is a heteronuclear molecule. hexose – A hexose is a monosaccharide with six carbon atoms. Example: Glucose is a hexose molecule. hexavalent – Hexavalent refers to an element or compound with a valence equal to six. Example: Chromium can be hexavalent. his – His is an abbreviation for the amino acid histidine. Histidine is also abbreviated as H.
holmium – Holmium is the name for the lanthanide element with atomic number 67 and is represented by the symbol Ho. homodimer – A homodimer is a dimer where both mer subunits are identical. homogeneous – Homogeneous refers to a substance that is consistent or uniform throughout its volume. Example: Air is considered a homogeneous mixture of gases. homogeneous catalysis – Homogeneous catalysis is a reaction involving a catalyst where the catalyst is in the same phase as the reactants. homonuclear – Homonuclear refers to molecules consisting of only one element. Examples: H2, O2, N2 are all homonuclear molecules. homopolymer – A homopolymer is a polymer where every mer unit of the chain is the same. Example: Polyvinylchloride (PVC) is a homopolymer. hormone – A hormone is a molecule that is secreted directly into the bloodstream of an organism through a ductless gland. The molecule acts as a chemical messenger, carrying information from one cell or group of cells to another area. Examples: Epinephrine, melatonin, serotonin, insulin, testosterone are all hormones. have 4n+2 delocalized and conjugated π-electrons where n is an integer. have every atom in the ring participating in the delocalization of the π-electrons or unshared electron pairs. Note: Hückel’s Rule does not work for systems with more than three fused rings. For example, pyrene contains four fused rings and is aromatic even though it has 16 conjugated π-electrons. humidity – Humidity is the measure of the amount of water vapor present in air. hybrid orbital – A hybrid orbital is an orbital formed by the combination of two or more atomic orbitals. Example: The orbitals that form around beryllium in BeF2 are a combination of s and p orbitals called sp hybrid orbitals. hydrargyrum – Hydrargyrum is the Latin name for the element mercury. Hydrargyrum means ‘liquid silver’ and is the source for mercury’s element symbol Hg. hydride – A hydride is a compound containing a hydride ion. Example: The strong base sodium hydride (NaH) is a hydride compound. hydride ion – A hydride ion is a negatively charged ion of hydrogen or H–. hydrocarbon – A hydrocarbon is a substance consisting only of carbon and hydrogen atoms. Examples: Benzene (C6H6) and hexane (C6H14) are hydrocarbons. hydrochlorofluorocarbon – A hydrochlorofluorocarbon is a compound composed of hydrogen, chlorine, fluorine and carbon atoms. Hydrochlorofluorocarons have been replacing traditional chlorofluorocarbons as refrigerants and aerosol propellants. They are typically considered less harmful to the environment than CFCs. hydrogen – Hydrogen is the name for the nonmetal element with atomic number 1 and is represented by the symbol H.
hydrogen bond – A hydrogen bond is a type of attractive (dipole-dipole) interaction between an electronegative atom and a hydrogen atom bonded to another electronegative atom. This bond always involves a hydrogen atom. Hydrogen bonds can occur between molecules or within parts of a single molecule. A hydrogen bond tends to be stronger than van der Waals forces, but weaker than covalent bonds or ionic bonds. 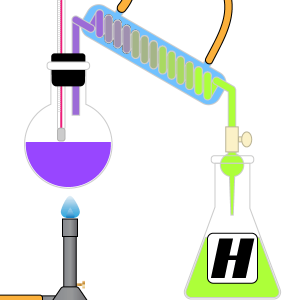 hydrogenation – Hydrogenation is a reduction reaction which results in an addition of hydrogen (usually as H2). If an organic compound is hydrogenated, it becomes more ‘saturated’. Hydrogenation has many applications, but most people are familiar with the reaction as the one used to make liquid oils into semi-solid and solid fats. There may be some health concerns associated with hydrogenation of unsaturated dietary fats to produce saturated fats and trans fats. the dash denotes the covalent bond that is broken during the reaction. hydrometer – A hydrometer is a device that measures the relative densities of two liquids. They are typically calibrated to measure the specific gravity of a liquid. Example: Salt water aquarium enthusiasts use hydrometers to monitor the salinity or salt content of their aquariums. hydron – A hydron is the cation of a hydrogen atom: H+. hydronium ion – Hydronium ion is the name given to the H3O+ cation, derived from the protonation of water. The hydronium ion is the simplest type of oxonium ion. hydrophilic – Hydrophilic is a molecule or functional group that forms strong hydrogen bonds with water. hydrophobic – Hydrophobic is a property of a substance to repel water. Hydrophobic molecules tend to be nonpolar molecules and group together. Examples: Oils and fats are hydrophobic. hydroxide – A hydroxide is an ion containing one oxygen and one hydrogen atom. The chemical formula for the hydroxide ion is OH–. hydroxyl group – The hydroxyl group is a functional group consisting of a hydrogen atom covalently bonded to an oxygen atom. The hydroxyl group is denoted by -OH in chemical structures and has a valence charge of -1.
hydroperoxyl – A hydroperoxyl is a radical with chemical formula HO2. Hydroperoxyls can be formed when a proton is donated to a superoxide ion, hydrogen added to an oxygen molecule or an oxygen atom added to a hydroxyl group. hygroscopic – Hygroscopic is a property of a substance to absorb or adsorb water from its surroundings. Examples: Zinc chloride, sodium chloride, and sodium hydroxide crystals are hygroscopic. hypergolic – Hypergolic refers to the property of a mixture to spontaneously combust when the components are mixed together. hypertonic – Hypertonic refers to a solution with higher osmotic pressure than another solution. hypochlorite – A hypochlorite is an anion with molecular formula ClO–. Hypochlorite also refers to any compound containing the hypochlorite anion. hypothesis – A hypothesis is an explanation that is proposed for a phenomenon. Formulating a hypothesis is a step of the scientific method. Examples: Upon observing that a lake appears blue under a blue sky, you might propose the hypothesis that the lake is blue because it is reflecting the sky. One alternate hypothesis would be that the lake is blue because water is blue. hypotonic – Hypotonic refers to a solution with lower osmotic pressure than another solution.